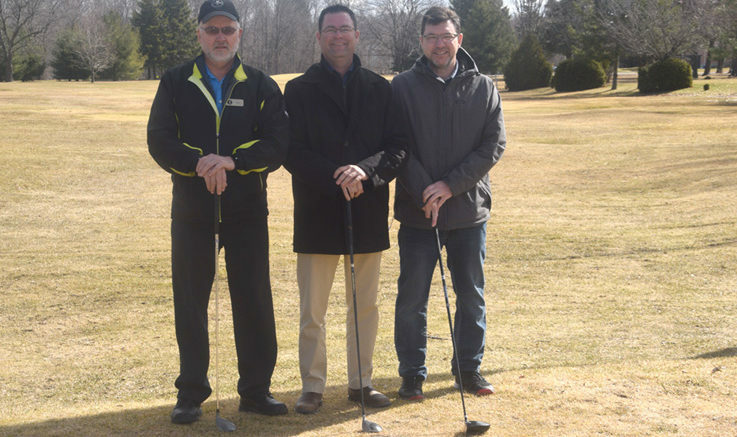 Napanee Golf and Country Club manager Milt Rose and Lennox and Addington County General Hospital Foundation's Mike Airhart and Ryan Moore stand next to the NGCC's first tee to help promote the hospital's upcoming tournament, set for June 5. Registration quickly sold out but sponsorship opportunities are still available for tees and greens by contacting the foundation at (613) 354-3301 Ext. 400. Proceeds will go the hospital. Held at the NGCC, this will mark the 23rd year of the tournament. Photo by Adam Prudhomme.